The Cerretta is the newest addition to Elio Altare's lineup and was first produced in 2005. Located in Serralunga, the vineyard plays host to some of Barlo's greatest names, including Giacomo Conterno. With the 2007 Barolo Cerretta Altare demonstrates the elegance that can be coaxed from this site in Serralunga. The Cerretta is the only Barolo Altare makes from vineyards outside his hometown of La Morra, but the house style nevertheless comes through in spades. 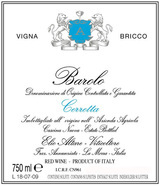 Dark fruit, tar, licorice, smoke and scorched earth are some of the nuances that flow from this muscular, virile Barolo. Anticipated maturity: 2017-2032.